So this actually started up as an experiment to bake naan at home. 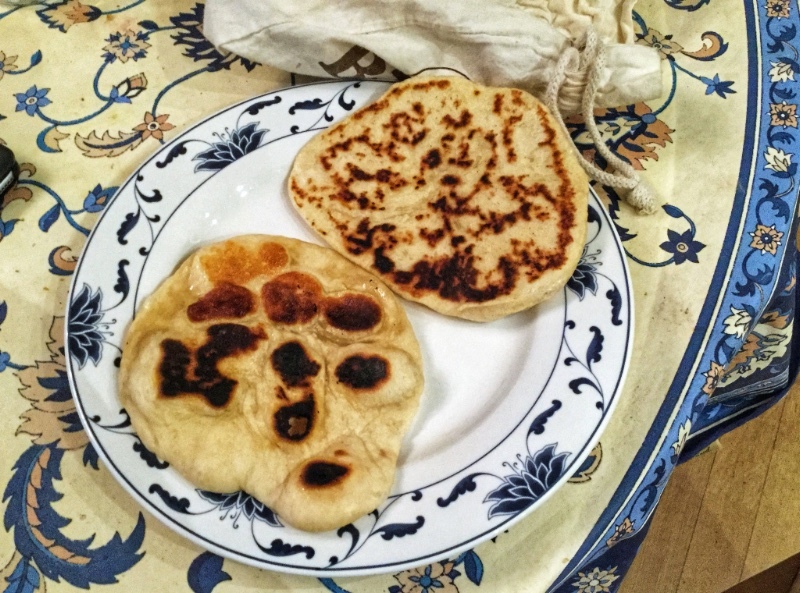 They don’t actually taste like naan–because naan requires a whole other kind of equipment and ingredients. But they were a huge hit with the kids especially. So I’m leaving them as puffed-up breads–they’re quite good, especially with garlic butter! Reactivate the yeast in 38°C water for 10 minutes. Combine all the dry ingredients in a bowl, mix well. When the yeast is activated (it should bubble up), mix it well. Then add the yoghurt and oil and mix. Finally add the water a little at a time, mixing well, until the dough is smooth and slightly sticky (you will probably not need the whole 115mL). Stretch and fold 5 times at 5 minutes intervals. Leave the dough to rise, covered (upending the mixing bowl over it works very well), for 1 hour. Put a carbon steel or cast iron skillet on moderate heat. When a drop of water evaporates within 3s, brush with oil. Split the dough into 8 parts, form each part into a round. Roll out one piece of dough with a rolling pin to an 8x8 teardrop-ish shape. Put the piece of dough on the skillet, cover. Watch until it puffs up and large bubbles form on the surface (around 30s-1min). Flip it, leave for 30s-1min. Repeat with all other pieces. For garlic butter version: brush with some soft butter mixed with chopped garlic just after rolling out the dough. These will keep in the fridge in a plastic bag, though they won't taste as good: re-heat in 180°C oven for 6-7 minutes.